The Rod Seal is the most critical in a cylinder application. It’s also subject to the harshest service conditions. Its failure can result in fluids leaking into the immediate environment and can jeopardize both performance and safety. Nothing gets past our seals! There’s no room for compromise if your business relies on lasting, consistent quality seals. All Seals is an industry leader in meeting the demanding requirements of Original Equipment Manufacturers in the areas of fluid power, chemical processing, agricultural, food & beverage, plumbing and other markets for seals and related custom parts. Our standards are unsurpassed. We source our seals from respected domestic and international companies renowned for their quality and engineering programs. We stock both standard and custom parts for our customers, assuring you a constant supply to meet your exact demands. All Seals also provides extensive value-added services, including JIT/Kanban programs, pre-production and MRO kitting, special marking and packaging options and more. Call us about your special needs. For specific material recommendations, please refer to our compounds brochure. For additional information, contact our responsive customer service department at 800.553.5054. U-Cups seal both the inside and outside diameters. They’re popular due to small gland space. Loaded U-Cups provide more effective low pressure sealing on both inside and outside diameters. Premium loaded U-Cups use two integrated seals to provide more effective low pressure sealing. 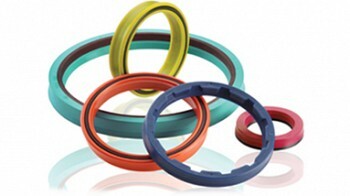 These PTFE seals are for extreme conditions where conventional elastomeric seals cannot be used. Buffer Seals protect rod seals from pressure spikes through channels allowing fluid to flow around the seal.